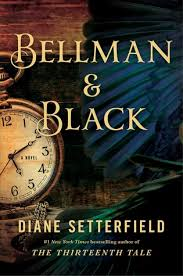 We were all pretty excited when Marianne chose Bellman & Black as this month’s book club selection. We all loved Diane Setterfield’s first novel The Thirteenth Tale when we read it a few years back. Sadly, this novel lacked that book’s – well, everything. As I pointed out when we met last night: “Did you notice that all the praise on the back of the book was for The Thirteenth Tale.” And true enough – there isn’t a single endorsement for this novel on its cover or inside its pages. Okay, maybe that doesn’t mean much in the whole scheme of things and I know I’m making it sound as though Bellman & Black is horrible and I guess I wouldn’t go so far as to say that, but it isn’t very good, either. William Bellman is just a kid playing somewhere in the English countryside when he decides to show off in front of his friends and uses a catapult to shoot a rook (similar to a crow) out of a tree. It took a long time for the stone to fly along its preordained trajectory. Or so it seemed. Time enough for William to hope that the bird, flapping into life, would rise upwards from the branch. The stone would fall harmlessly to earth and the rook’s granite laughter would taunt them from the sky. Instead, William hits and kills the bird and thus leaves innocence and childhood behind him and begins the downward slope towards death. And yes, it’s really this heavy-handed. Will’s life is marked with great successes and tremendous tragedies. We watch him turn his uncle’s mill into a financial success. We watch him fall in love and have a family. And we watch things start to fall apart. But the thing is – and it is a thing that we talked about last night – none of it mattered all that much because Will was a character we knew or cared little about. He was driven, surely and haunted, certainly, but not by the rooks which made strange appearances (sort of like encyclopedia entries) throughout the book. When William suffers a tragic personal loss, he makes a deal with a mysterious stranger, Mr. Black, and he suddenly finds himself building a one-stop funeral emporium. We’re talking Victorian England here, when people mourned for years and spent money (apparently) on all manner of funereal accoutrements. So, just as we watched him build Bellman Mill, we learn all the nooks and crannies of Bellman & Black, but none of it is interesting enough to sustain a 300 plus page narrative. And trust me, the stuff about the rooks doesn’t help. At the end of the day, Setterfield’s book is a less schmaltzy take on, say, a book like Tuesday’s With Morrie. We’re meant to understand that life must have checks and balances, and that when we care too much about things that don’t matter (wealth, success) we miss out on those things that truly do. Bellman & Black wasn’t hard to read, but I won’t be recommending it to anyone else. This entry was posted in Book Chat and tagged 2013, book club pick, Book Review, really disappointing books by Christie. Bookmark the permalink.